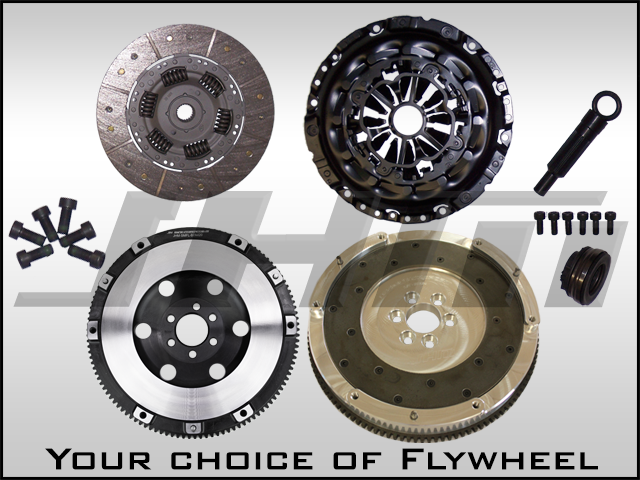 JHM B7 A4 CHROME-MOLY FORGED SINGLE-MASS LIGHTWEIGHT FLYWHEELS AVAILABLE NOW!! JHM Flywheel is 8lbs Lighter! 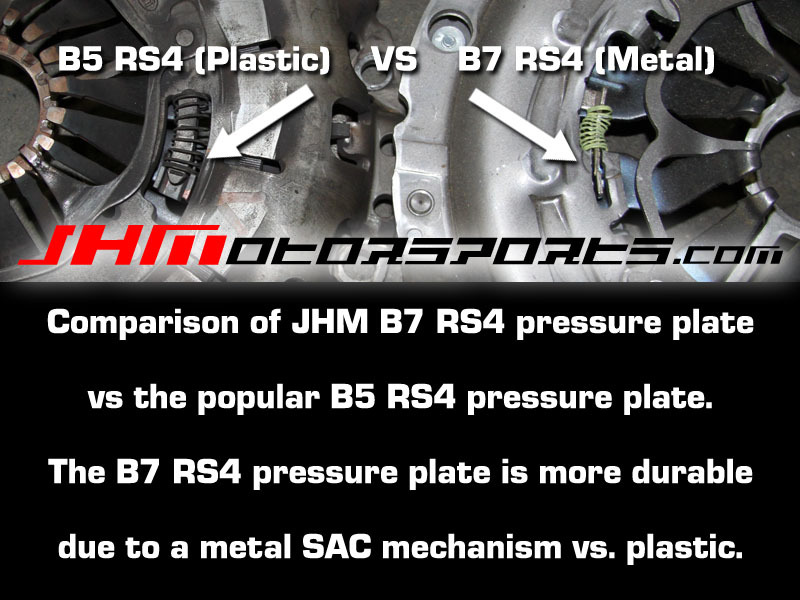 JHM has been testing and abusing the B7-RS4 pressure plate since early 2009. This started with our B6-B7 S4 and B7 RS4 product development. In mid 2009, we purchased a 2005 B6-S4 to compliment our long time R&D car, our flagship 2001.5 Nogaro Blue B5-S4. To this day we still own, daily drive, and test products on our in house B5-S4. Of course this car has the full JHM treatment which now features a JHM built motor with Record Setting JHM RS6-R turbos. This car has been running our new Lightweight Flywheel and Clutch setup (Stage 4) with the B7-RS4 pressure plate for quite some time. We've seen much better results with this new kit than we had with the older B5-RS4 pressure plate setups we used to sell. Yes, some of these are videos of our in house 2005 B6-S4 and our B7-RS4, not a B7-A4 2.0T. These videos better demonstrate the performance of this new clutch kit due to the fact that these cars have way more instant torque than the B7-A4 2.0T because of their increased displacement, all motor power design, and no turbo lag. Pressure plate manufacturers use torque - not horsepower - to measure how much power a clutch kit can hold. Torque - not horsepower - is a measurable value. Horsepower is created through torque and revolutions per minute of the motor using a mathematical calculation, not by measuring the force of the motor directly. 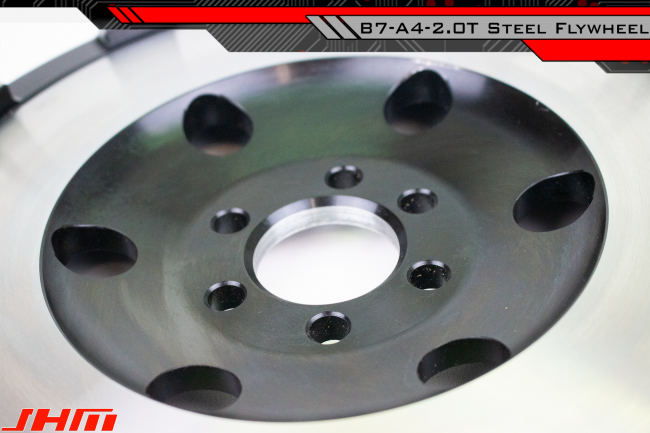 Therefore torque - not horsepower - is critical when measuring the performance of a clutch and pressure plate. 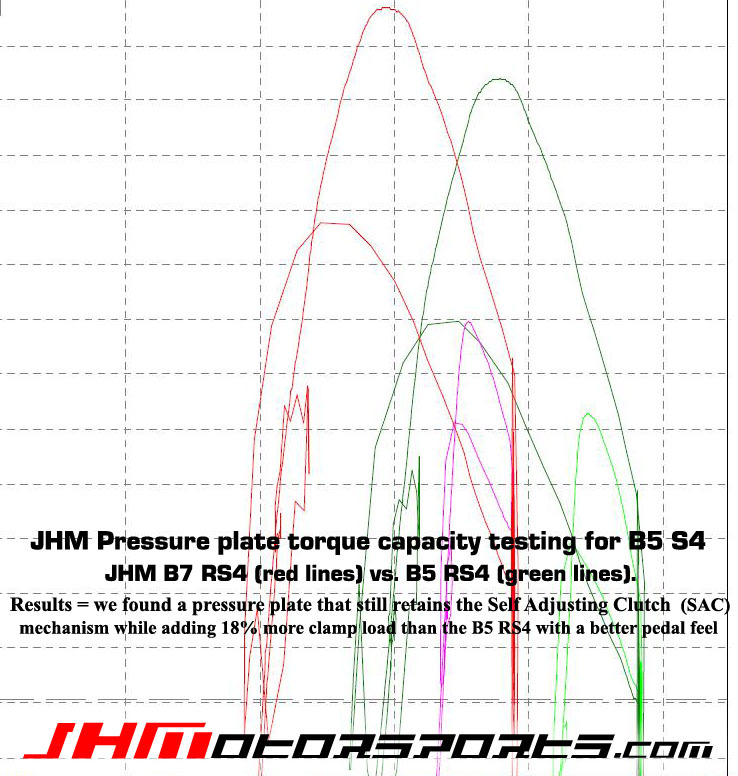 We looked at these results from our V8 cars and 2.7t cars and thought that we had to get this setup on a B7-A4 2.0T. We wanted to offer our customers the extra durability, streetability, and lower cost of the B7-RS4 pressure plate. Unfortunately, the B7 RS4 pressure plate IS NOT a bolt on part for the B7-A4 2.0T OEM or standard aftermarket flywheels. With our custom made, lightweight flywheel, now it is. This Pressure Plate and Lightweight Flywheel combination allow you to power-shift your 2.0T with neck-snapping results! Plus you can have smooth daily drive-ability of an OEM disc and Pressure Plate setup that can hold a 400 plus hp car stock (B7 RS4). So 98% of 2.0t owners will only need the stage 1 version of this kit. 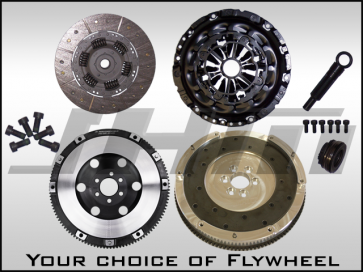 - ALUMINUM FLYWHEEL USA MADE - These JHM lightweight flywheels are made out of aluminum and weigh almost 50% less than a stock flywheel: 12 pounds versus 23 pounds on a B7-A4 2.0T!!! The iron friction liner is replaceable, so you will never have to buy a new flywheel again. Simply swap the liner if you ever replace your clutch. **The crank position ring is welded to the ring gear and fastened with countersunk screws (not cheap pins which are prone to shearing and can be found on other brands). 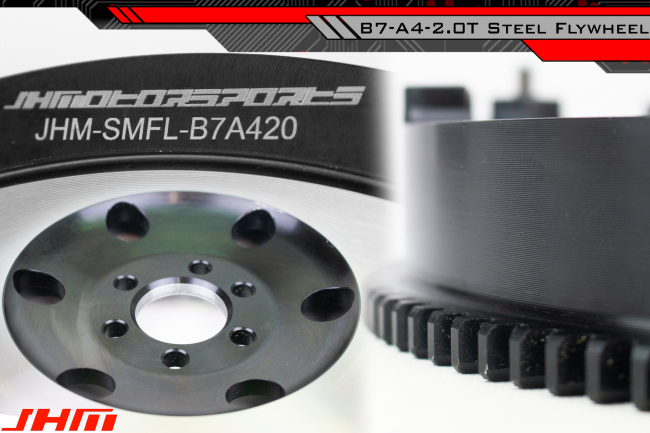 ** An added benefit to this Lightweight Flywheel upgrade is that it allows B7-A4 2.0T owners to run the B7-RS4 pressure plate featured in our JHM clutch kits. This higher clamp load pressure plate is not compatible with other flywheels on the market, so you must run a JHM lightweight flywheel in order to use it. -JHM Stage 1 (Full Organic): Good for Stock, Stage 2, Stage 3 2.0T Motors. 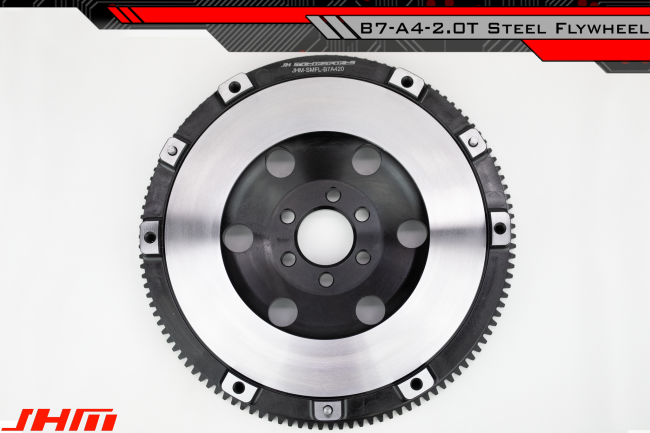 This is the same clutch material that comes on the B7-RS4 and is capable of holding more power than a stock 2.0T motor can handle. -JHM Stage 3 (hybrid Ceramic/Metal Backed Organic): Good for all Stage 3, Big Turbo 2.0T stock or built engines. INCLUDES THE FOLLOWING -JHM 12lb Aluminum Lightweight flywheel or JHM Forged Chrome-Moly Lightweight Flywheel - 6x OEM Flywheel to crank bolts - OEM B7 RS4 pressure plate - clutch disc (choose stage below before ordering) - 6x Pressure plate to flywheel bolts - Throwout bearing - Clutch alignment tool - Pilot Bearing (presses into crank). 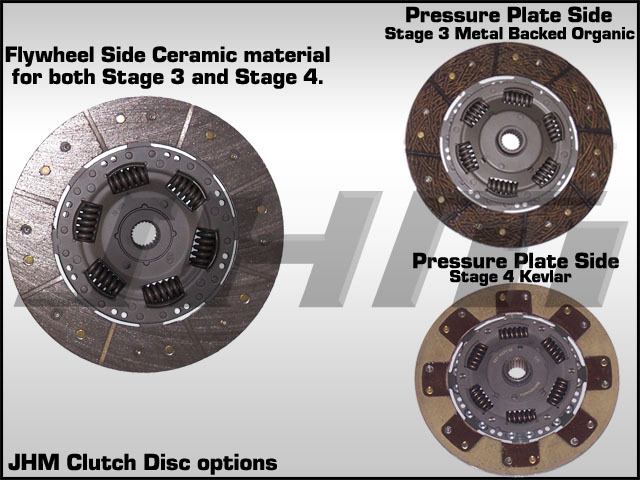 Best clutch kit on the market ! Great item at a great price and pedal feel is great ! I totally love it, I should of bought it sooner than I have. First aftermarket clutch I ever had and only didn't order it sooner because I was afraid of the quick catch, although now I forget about it. My Mechanic who installed it was TOTALLY impressed with it and so am I.